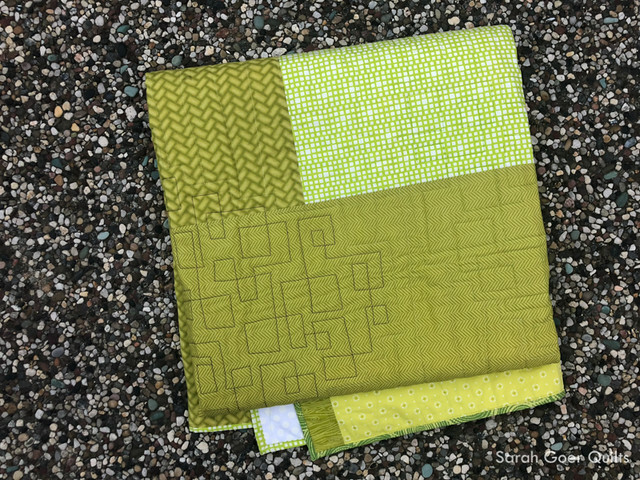 My Greenery project was born out of the Pantone Quilt Challenge in 2017 coupled with the Bay Area Modern scrap challenge to utilize squares and rectangles. I finished the quilt top in May 2017, in time to submit to the Just the Top category of the 2017 Pantone Quilt Challenge. I’m so excited to have finally finished this quilt, the original inspiration for Planned Improv: Scrappy Squares which I started teaching in 2017. This project started with a thumbnail sketch and a pile of scraps. I began by cutting all my Greenery scraps into squares. Purple was added by the advice of my friend, Mel. I worked improvisationally on the design wall with my squares and then "made it work" to piece and fill in with background fabrics (also from the scrap bin) to make my first unit. Then I repeated my process to make related units. I initially thought I would make nine, but felt "done" after 7, which resulted in the chosen layout. I quilted this one on the longarm at Always Quilting. 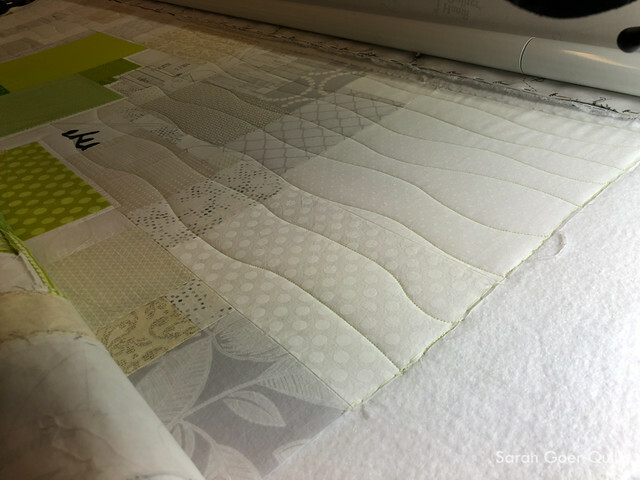 I started with some echo quilting around my scrappy squares. Then I filled in the background with organic, wavy lines. Lastly, I filled each scrappy square section with a boxy meander. I chose three thread colors, a pale green for the background, darker green for the squares, and purple for the center section. 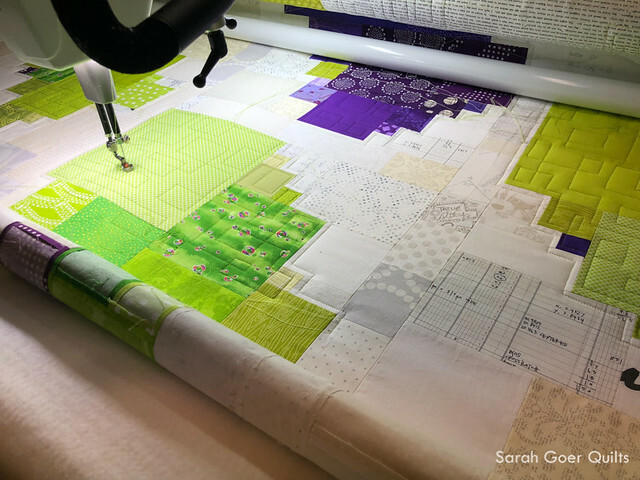 There were many stops and starts between switching colors and needing to advance the quilt on the frame. I'm quite pleased with the result, but it was a bit of "beat the clock" at the end of the afternoon to finish up before the shop closed. I underestimated how much time would be spent changing colors. I made a scrappy binding and piecing the back with any stash fabric close to the color palette. Overall, it's a very scrappy quilt. It finished at approximately 61" x 66". 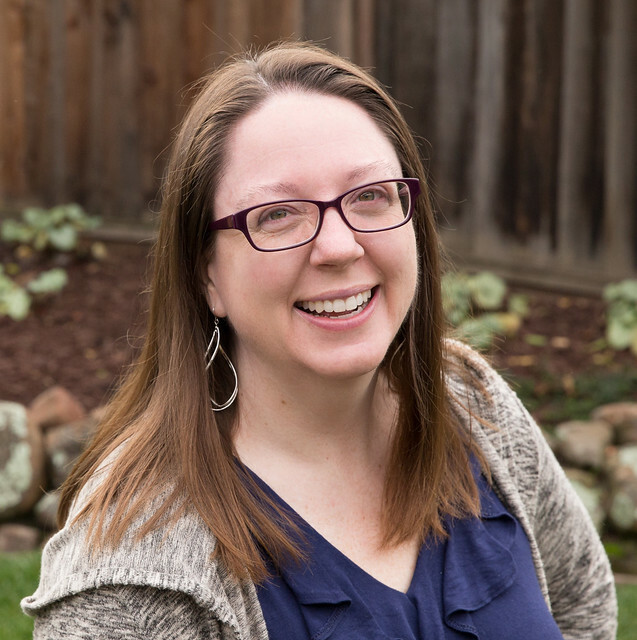 I've linked up to the Q4 FAL Finishes Linkup. Posted in Quilting. 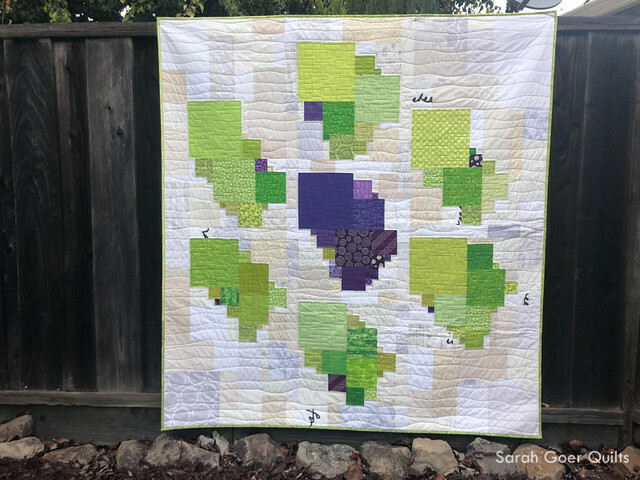 Tags: finished quilt, Greenery, lap quilt, longarm quilting, planned improv, scrappy squares on November 27, 2018 by sarah. Thank you, Yvonne. It’s nice when a vision in my head comes out as intended. I need to get some more longarm dates on the books. It’s so much fun! You are courageous doing all those color changes when you rented the machine! 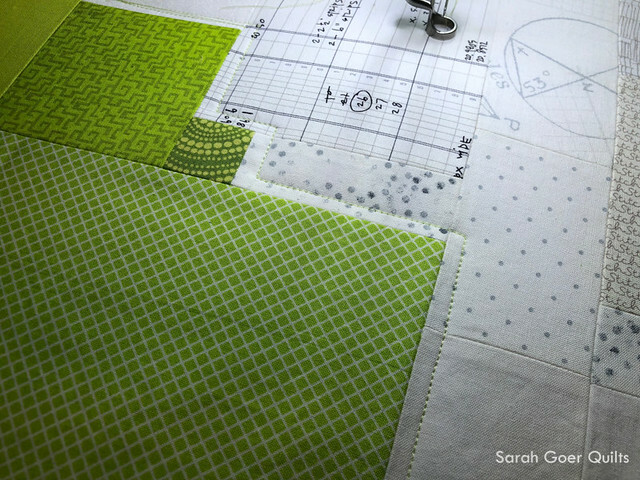 I have yet to free motion quilt on a longarm, this is inspiring me to take the risk (although I'll skip the color changes). It worked out perfectly! That was my third trip. Apparently things had been too quick and easy with just one color of thread. ;-) You should definitely go for it. It's so much fun! Thanks for visiting, Kathleen. I love the quilt. The layout is great and those improv blocks are very inspiring. And the technique sounds wonderful. More "manageable" than simply improv :) Glad you managed to still finish it in time even with the thread changes. Now enjoy your finish! Thank you, Melanie. I've really enjoyed teaching the technique. I think Planned Improv -- improv with some rules -- is a great introduction to improv piecing. It's a great finish Sarah. 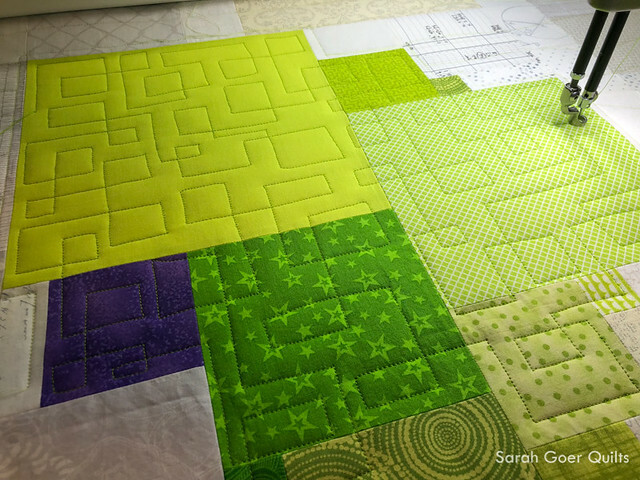 I like the way the planned improv worked out and the quilting looks spectacular. Thank you so much, Lisa! I'm glad I held off on quilting this one until I could do what I'd been envisioning. Lovely quilt! I do so like hearing about the quilting for the design and quilting. Congrats on the finish and on behalf of the enitre FAL crew, thanks for participating!